Known as the paradise for scuba diver, Pulau Redang is one of the most popular islands in Malaysia that offers plenty of opportunities on marine life discovery. With plenty of diving sites feature diversified of fish and coral species, diving in Redang promises an unforgettable experience for the novices as well as the experience divers. Jellyfish, blacktip sharks, jacks, barracudas, fusiliers, snappers and schools of yellowtail are some of the common residents here waiting to be discovered. There is abundance of dive sites near to the archipelago of Redang. Depending on your expectation and expertise level, there are more than 20 dive sites available for the diving nerds, including the challenging deep dives and beach dives, with a good blend of coral gardens, sandy bottom as well as wall dives providing lot of chances for macro photography. Tunnel Point and Tanjung Tokong are some of the most popular dive sites in Redang. Plenty of hard and soft corals can be seen surrounding the reef as well as school of bumphead parrotfish, snappers, small barracudas, fusiliers, jacks, flatworms and nudibranch can all be discovered here. For divers opting for night dives, the housereefs at Tanjung Mak Cantik and Tanjung Tengah in Pasir Panjang are perfect to dive in. Not only perfect for night dives, the sites here also suitable for snorkelling due to its shallow waters. If your main purpose is to discover corals, Mak Cantik is your best bet. With 12-18m deep, this spot home to a huge coral garden comprising plenty of soft and hard corals. You will also find no short of fish species for diving here, school of yellowtail barracudas, batfish, snappers, rays, puffers, damselfish, parrotfish, wrasses, butterflyfish, angelfish and black-tip reef sharks are some of the tropical fish species that you will encounter here. Diving can be done throughout the year except for the Monsoon season that falls between November and March (end). Also to take note that some dive sites do occasionally receive strong current where diving can become difficult, before you plan for a diving trip in Redang, it is always good to refer to your local tour company or research through the net to get an idea on the best timing to visit Pulau Redang as well as the best spot to dive in. 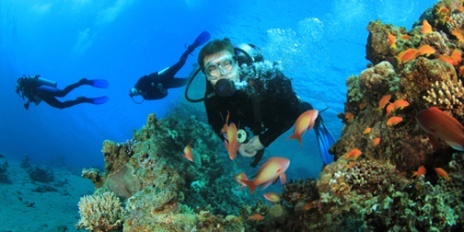 Diving tours can be obtained from most of the resorts in Redang. Whether you are an experience diver or just about to start to experience this exciting adventurous activity, joining a diving tour will ensure you to get the most out of your underwater trip. Not only that, most of the diving package will covers for your transportation and diving equipments as well as onboard meals where you do not need to worry on how to reach to the diving sites as well as where to rent the diving equipment and find a place to eat. All these can become a hassle especially if this is your first trip to Redang Island.